General Tools Cell Phone Screwdriver, 1-1/2 in Point, 4-5/8 in Overall Length, Steel Blade, Chrome Plated Blade made of heat treated 8650 alloy steel (nickel-chromium-molybdenum) that is chrome plated to resist corrosion. Rotating cap, facets fit palm, recess fits finger tip, driver tip size shown on cap and a 8-sided non-slip cushion grip. Color coded ring identifies type of tip. Carded. Blade made of heat treated 8650 alloy steel (nickel-chromium-molybdenum) that is chrome plated to resist corrosion. Rotating cap; Facets fit palm, recess fits finger tip, driver tip size shown on cap and a 8-sided non-slip cushion grip. Color coded ring identifies type of tip. Carded. 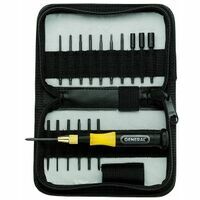 General Tools Micro Screwdriver Set, Precision, 2 Pieces, Includes: Phillips NO 0 and Slotted Tip 3/32 in, For Close and Delicate Work General Tools Screwdriver, Series: UltraTech, Precision, 5/64 in Point, Slotted Point, 4-7/8 in Overall Length, 3/4 in Body Diameter, 0.014 in Blade Thickness, 5/64 in Blade Diameter, 3-3/8 in Cushion Grip Handle, Alloy Steel Blade, Chrome Plated Provides 6 popular Phillips and slotted screwdrivers for a wide range of fastening applications. Swivel head handles provide precision and reach. Tough plastic shafts with soft cushion grips. Includes: 0-point and 1-point Phillips, and 1.4-mm, 2.0-mm, 2.4-mm and 3.0-mm slotted screwdrivers and plastic storage case. Carded. 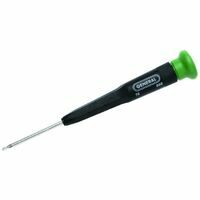 General Tools Screwdriver, Series: UltraTech, Precision, 4-7/8 in Overall Length, 3/4 in Body Diameter, 1/2 in Cushion Grip Handle, Alloy Steel Blade, Chrome Plated General Tools Screwdriver, Slotted, Series: UltraTech, Precision, 9/64 in Point, 6-3/8 in Overall Length, 15/16 in Body Diameter, 0.022 in Blade Thickness, 9/64 in Blade Diameter, 5/8 in Cushion Grip Handle, Alloy Steel Blade, Chrome Plated Free spinning swivel head, bodies are knurled and nickel plated; blades are oxide to prevent rust. Used for jewelry repair, model making, watch making and other small scale applications. 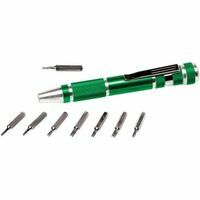 Includes: .040", .055", .070" and .100" Slotted and #0 Phillips and plastic storage case. 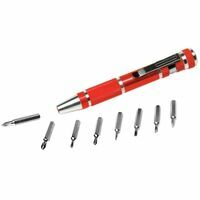 Performance Tool Pocket Screwdriver Set, Precision, 9 Pieces, Includes: Phillips Combination Bits NO 000/ NO 00, NO 0/ NO 1, 1 in Slotted Bits 1/16, 5/64, 3/32 in, Red, Anodized Aluminum Alloy Handle, For General Purpose Applications Performance Tool Pocket Screwdriver Set, Precision, 9 Pieces, Includes: 1 in Torx Bits T3, T4, T5, T6, T7, T8, T9, T10, Green, Anodized Aluminum Alloy Handle, For Mobile Phones and Other Electronics Applications Swivel head handles provide precision and reach, bright, plated shafts are fluted for a steady, solid grip. Hardened and tempered steel blades with blued finish to resist corrosion. 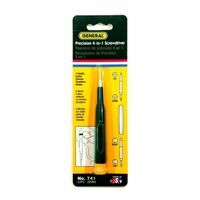 Includes one each: #0 and #1 Phillips; 1.4mm, 1.8mm, 2.3mm and 3.0 mm Slotted, plastic storage case to index tools. Carded. General Tools Ultratech Screwdriver Set, Precision, 18 Pieces, Includes: (1) Multi-Blade Handle, (17) Interchangeable Blades - Slotted 3/64, 1/16, 5/64, 3/32 in - Phillips - NO 000, NO 00; Star T6, T7, T8, T9, Hex -0.050, 1/16, 5/64 in - Nut Driver 3/32, 1/8, 5/32, Ergonomic Handle Set features an assortment of blades in two distinct (600 and 700 series) handle sizes. The color-coded ring on each screwdriver helps you to easily identify the blade type when working in the field. Used for computer and electronics repair. Includes one each: T6 with 1-1/2" blade, T7 with 1-1/2" blade, T8 with 2-1/2" blade, T9 with 2-1/2" blade and T10 with 2-1/2" blade. Long lasting alloy steel blades in three popular blade styles, Slotted, Phillips and Torx. Used for computer and electronics repair, or any other application where space is limited. Ergonomically designed handle with color coded swivel caps. Includes: 3/64", 1/16", 5/64" and 3/32" Slotted, #000, #00 and #0 Phillips, T6, T7 and T8 Torx; blade length is 1-1/2".